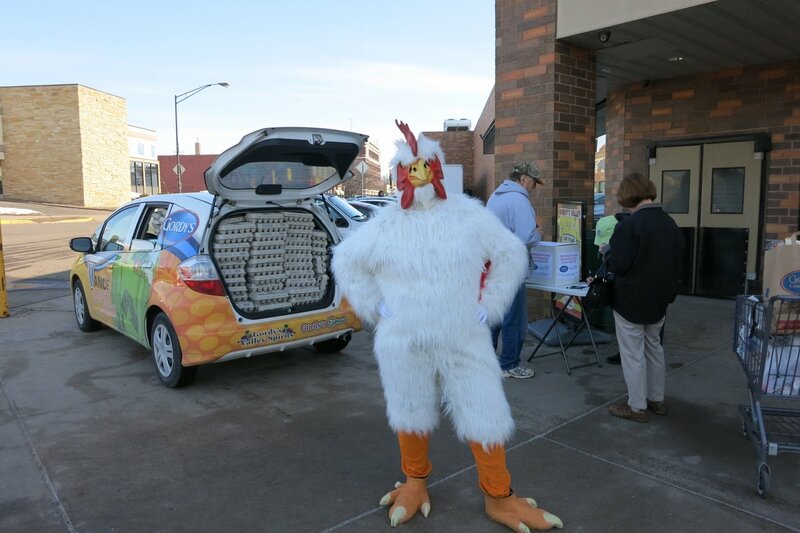 Today and tomorrow, Gordy’s Guru and Henrietta Hen will be on site at 4 Gordy’s stores in Wisconsin with the Gordy’s Grocery Getter – a Honda Fit. It’s stuffed full of Sparboe Farms egg cartons and shoppers have the opportunity to guess how many eggs fit in the ‘Fit’ to win a year’s worth of free egg! Elias and Britta were on site at the downtown Chippewa Falls store this morning and we got a bunch of guesses! To make things even more fun, Gordy’s is running a red-hot promotion on eggs – only $0.68 for a dozen large Sparboe Farms eggs.